I should probably call this secret ingredient chili. You are not going to BELIEVE what is in this chili. I mean, you might freak a little bit. Super rich and dark and creamy chocolate ice cream. !!!!!! It adds a depth of flavor to the chili that is just insane. It’s not chocolately or creamy or anything. It’s perfect. 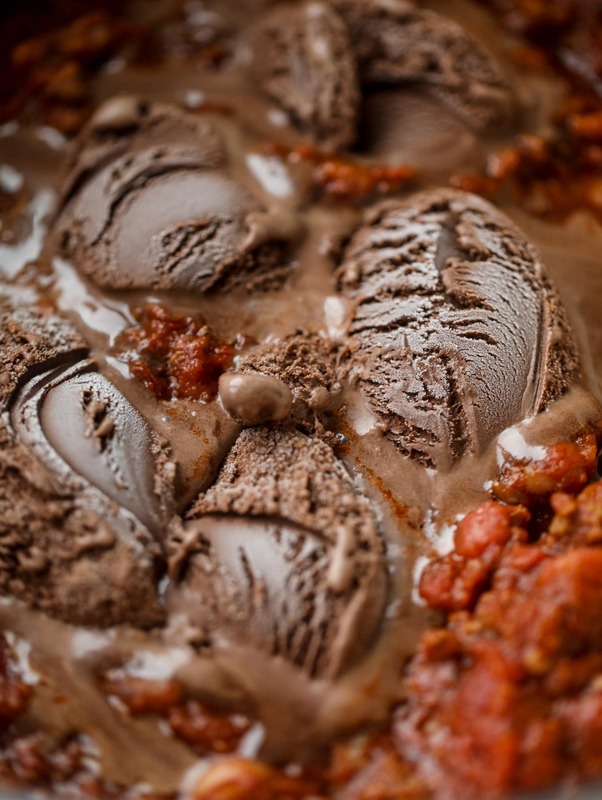 And I’m not sure if I can go on making chili without chocolate ice cream. The most important thing to note: it wasn’t MY idea. I wish I was this brilliant! I saw this in a recipe first created by Jeni Britton Bauer of Jeni’s ice cream (of course!) last fall and flipped out. It was right after I had Emilia and I had finished up all of my recipes for the year, so I didn’t end up photographing it but I was hooked. I knew that I had to share come fall of 2018 and I have been waiting like a complete lunatic. Jeni’s recipe is more of a Cincinnati chili which isn’t my fave, so I took matter into my own hands. I like a heartier chili that definitely has beans. Pinto beans are my go-to. I used the base of one of my favorite chilis but still used Jeni’s super dark chocolate ice cream. Next to Millie’s chocolate here in Pittsburgh, it’s the best. And I could honestly care less about chocolate ice cream! Plain chocolate ice cream just doesn’t do it for me. But this dark chocolate is SO dark. It’s super rich but not in a too-sweet-for-your-teeth way. If you try this, make sure you find a super super super dark chocolate ice cream. it’s the KEY. Grab a dark chocolate gelato if you must. Before you flip your lid, think about it! Cocoa or some form of chocolate is an ingredient in a lot of chili. I have an old recipe right here that uses cocoa chili powder, because back in the day when I first started blogging, McCormick made a cocoa chili powder. I loved that! Luckily we can still make our own version mixing cocoa powder and chili powder. Or we can just add rich chocolate ice cream like a crazy person because it is divine. I figured it wasn’t THAT crazy because I add half and half to my bolognese in The Pretty Dish. So ice cream in a tomato-based recipe wasn’t far off. This is also the recipe that I used in my chili bar on Friday, along with the roasted corn white chicken chili from The Pretty Dish. Both have been in major rotation here for a year now and we love them so much. Oh and just in case you are still freaked: it doesn’t make your chili TASTE like chocolate. Not full blown chocolate. It still tastes like fabulous, flavorful chili and you can add all the toppings you would like. You might want to keep the secret to yourself, though. Maybe until your friends are finished with their chili. I never even told Eddie about the ice cream in this chili and he just found out as he read this blog post. It’s the most delicious form of trickery! This fire and ice chili has a secret ingredient that makes it rich, velvety and insanely delicious. Dark chocolate ice cream is stirred in before serving and adds a crazy depth of flavor while bringing so much richness to your favorite bowl. You have to try it! Heat a large pot over medium- low heat and add the olive oil. Add in the onions, peppers and garlic along with the salt and pepper. Stir and cook for 6 to 8 minutes, until translucent. Add in the ground beef and break it apart with a wooden spoon. Increase the heat to medium and brown the beef until all the fat is rendered. I cook it a bit longer so some of that fat cooks off too. Stir in the tomato paste, chili powder, sugar, cumin, oregano, paprika, red pepper and nutmeg until combined. Cook for 5 minutes. Add in the crushed tomatoes, fire roasted tomatoes and pinto beans. Bring the mixer to a simmer. Simmer, stirring often, for 30 to 45 minutes. Stir in the chocolate ice and simmer for another 15 minutes. Serve with your favorite toppings. For how I set up a chili bar, see here. Weekend Photo Diary: Adventures in Apple Picking! Oh wow!!! I’m dying to try this!!! I was 100% expecting a Game of Thrones tie in with the name of the recipe! Perfect for a party when it’s (finally) on again! Listen. You’ve never led me astray before so I’m gonna try this. But I just need you to know I’m gonna be thinking it’s crazy pants THE WHOLE TIME. But I’m so intrigued so obviously I’m in. bahahaha. i promise it’s delish! My dad makes his chili with Hershey kisses so this isn’t too far fetched for me. More importantly, how does Eddie feel now that he knows? oh my gosh that is crazy, haha! KP, I’m like 80% with you but it never hurts to have fun once in awhile. It’s all about moderation. Oh my gosh, ice cream in 🌶 chili! I’m hooked! not all of it! i love jeni’s but the chocolate from millie’s is the best i’ve ever had! Hmmm… maybe I’ll try their chocolate. I only ever get Millie’s Vietnamese coffee because it is ridiculous and I can’t replicate it. But I’m a jeni’s freak and I don’t even love ice cream. ohhhh yes the coffee is insane. i love it. i love the coffee WITH the chocolate! i always used to get the peanut butter but then they went and changed it and i think it’s gross now! hi! not sure why you commented again since you already commented above as KP? it’s okay if you’re not into it! oh that’s odd, it’s coming from the same IP address! I adore Jeni Britton Bauer and of course Jeni’s ice cream! She really is an absolute ice cream genius! I’ve been leaving her many, not so subtle hints, to bring a scoop should to Milwaukee (this is the dairy state after all!) I’m a native Ohioan (and of Greek ethnicity) so I’m actually a big fan of Cincinnati chili! Looks I’m just going to have to try both versions…,I mean why not have an excuse to have more chili with ice cream in it!! :). Thanks for the recipe!! i wish we had a Jeni’s in pittsburgh too!! I made it last night. As soon as I saw the secret ingredient I went straight to the store. Delicious! thanks jenn! so glad you liked it! OMG- this reminds me of a restaurant in DC that serves risotto with coconut ice cream- it melts into the most creamy, decadent sauce. Sounds fabulous! If I don’t add the meat, will it taste ok? Can you suggest a substitution for meat? Also, I don’t eat poultry. I was thinking about portobello mushrooms. I could use soy crumbles, but my sister can’t eat soy. i definitely think it will! i would do about 12 to 16 ounces cremini mushrooms. chop them up and saute with the veggies! Then maybe add an extra can or 2 of beans? Whatever kind you like! I think it will be perfect. Joan, I’ve used lentils as a sub for ground meat in meatloaf etc. – I think it’d be perfect here! Maybe a combo of mushrooms and lentils? that’s an excellent idea! i didn’t even think of that. it should work great! I’m wondering the same thing as Maureen. Do you add the ice cream 15 minutes before serving or just as a way to finish the recipe then it can be served later? I’m making this for friends this week! I am wondering why I did not receive a response to my question? It was so good… Thank you for posting. Wanted to share that I made this recipe today for a chili Cook-off and ended up winning! This chili is fantastic! I’d love to make this recipe for a chili cook-off at work. Do you think it’d work in the crockpot? I’m thinking of cooking it on low overnight and stirring in the chocolate ice cream in the morning, and just keeping it on the warm setting until lunch. Let me know what you think! i think that sounds perfect!! it should definitely work! good luck :) a few people have won chili cook offs with it this year! yay! I cannot wait to make this! I’m trying to decide between this one, and your roasted corn and chicken chili for a cook off! I am so torn, because I looooove that white chili! You are pretty much my food hero. Question, if I want to make this ahead of time, should I add the ice cream when making it, or when I reheat it the day of? Thanks! I used New Mexico hot chili powder and a teaspoon (not half) of Turkish (very hot) red pepper flakes plus homemade chocolate ice cream, and it was delicious! I also covered it during simmering as we like more liquid in our chili. Definitely will make this again.